In an unprecedented act that appears to be an act of surrender to China’s communist regime, the Vatican has asked legitimate Chinese bishops to step down from their post in order to make way for the installation of new, illegitimate bishops, hand-picked by the atheistic government. The Vatican has asked Bishop Peter Zhuang Jianjian to retire in order to allow a state-sanctioned and excommunicated bishop to take his place while “another Vatican-appointed bishop was asked to downgrade himself as the assistant of an illicit bishop,” according to a report in AsiaNews. Bishop Peter Zhuang Jianjian of Shantou was forced to travel to Beijing last December 2017 where an unnamed Vatican prelate (which sources speculate to have been Archbishop Claudio Maria Celli, a negotiator between the Vatican and China) asked him to step aside to allow a communist-appointed bishop to take his place. Bishop Zhuang was secretly ordained with Vatican approval in 2006. The Chinese government wants to replace Zhuang with excommunicated Bishop Huang Bingzhang, who is a member of the National People’s Congress. 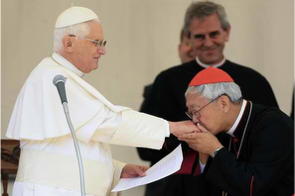 Huang was previously excommunicated because he was ordained without Vatican approval. Two months prior to the meeting with the Vatican prelate, on October 26, 2017, Bishop Zhuang received a letter demanding the 88-year-old bishop to resign to give way to the excommunicated bishop, whom the Holy See is going to recognize. Bishop Zhuang at that time refused to obey and rather “carry His Cross” for being disobedient.